Does the Bible promote drinking alcohol or does it condemn it? Drinking alcohol… Is it right? Is it wrong? Does anyone care? I will be going into the subject of “alcohol in the Bible.” This is a very touchy, sensitive, and downright controversial subject in the church today. I will be going deep into the scriptures and pulling out verses AND entire passages to see what the bible says. Not only that but I will also be looking at the original Hebrew and Greek words AND how they are used in each of the verses as well as pulling out what was going on in the time period that it was written in to get the correct idea of what the author is actually trying to say. I will give a clear definition of what the words mean and show how they are accurate in how they are used in the ancient scriptures and prove how it is still applicable today. Please keep in mind that I am going into this with a clear mind and not judging whether it’s good or bad I’m solely looking into the scriptures and I will give my opinion based on my findings. You can’t argue with the Word of God. However, whether you agree or not, feel free to leave me a comment at the end, as long as it is respectful I welcome them all. Let me begin with laying out the Hebrew words for wine and their meanings. The most common Hebrew word for wine is yayin, from a root meaning “to boil up,” “to be in a ferment” and it is what we mostly think of when we think of wine, actually being fermented. The next most common word is tirosh, properly “must”; sometimes rendered as “wine,” “new wine,” or “sweet wine.” It can represent wine at any stage in the fermentation process and in some places it represents wine made from the first drippings of the juice before the winepress was trodden. As such it would be particularly potent. It can certainly be alcoholic, as in Hos 4:11. The next word is shekar, literally “strong drink”; “denotes any inebriating drink with about 7–10 percent alcoholic content. Another interesting word is chemer corresponding to the Aramaic word chamar “wine”; the word”conveys the idea of ‘foaming,’ as in the process of fermentation. It is derived from the root hamar, meaning ‘to boil up.’” The word asis means “sweet wine” or “new wine” which contrary to some popular belief that it means non-alcoholic grape juice, it actually means that was made in the current year and it can (if drank enough) have intoxicating power (meaning you can get drunk off of it). refers to deposits of dead yeast or residual yeast and other particles that precipitate, or are carried by the action of “fining”, to the bottom of a vat of wine after fermentation and ageing. The yeast deposits in beer brewing are known as trub. However, yeast deposits from secondary fermentation of beer are referred to as lees. Hopefully that makes more sense. Now let’s move on to the word sobhe, which simply means drink, liquor, wine. The Hebrew words mamsak and mesekh mean “mixed drink,” “mixed wine,” “drink-offering;” the words are literally a mixture of wine and water with spices that increase its alcoholic properties. Last but defiantly not least mezeg means “mixture”, “mixed wine.” Now the Hebrew word for grape juice is Mishrah and is used once in the entire bible. It is found it Numbers 6:3 and we will go over that a little later. Unlike the Hebrew language, which has a wide variety of words for alcoholic beverages, there are only five words used in the Greek. We begin with the most common which is oinos. Oinos is the common word translated “wine” in the New Testament and it compares to the Hebrew word yayin. The word gleukos means “sweet wine” (sometimes rendered “new wine”) which can represent anytime in the fermentation process (within the first year). Sikera is the Greek word for “strong drink.” Oxos means vinegar or sour wine. Oxos could be made from grape wine or other fermented beverages. When it is mixed with water, it was a common, cheap drink of the poor and of the Roman army. The greek word methusma literally means an intoxicating drink. Finally, the Greek word for “grape juice” (trux) is not used in the New Testament. Let me begin by stating several verses that look down upon/talk negatively about alcohol. One of the first verses that come to mind is Proverbs 20:1 “Wine (yayin*) is a mocker, Strong drink (shekar*) is a brawler, and whoever staggers because of them is not wise.” In 1 Sam 1:14; Prov 23:30; Isa 5:11, 22; 28:1, 7; 29:9; 56:12; Jer 23:9; 51:7; Joel 3:3 the bible clearly condemned drunkenness. Notice now in the New Testament in Gal 5:19-21 (Works of the flesh… drunkenness [methusma**]); Eph 5:18 (“And be not drunk [methusma**])with wine [Oinos**], wherein is excess…); 1 Tim 3:3, 8; Titus 1:7; 2:3 (Pastors, deacons, and older women serving as role models for younger women, “not given (addicted) to wine [Oinos**] or strong drink [Sikera**].”); along with several other passages that use wine or strong drink as examples of not getting drunk because of God’s wrath, immorality, and so on, such as Rev 14:8, 10; 16:19; 17:2; and last but not least 18:3). All of these speak negatively toward alcohol but more specifically against drunkenness. While we all know that there are defiantly bad, or negative, verses and statements in the bible, there are also verses that are pretty neutral that speak of people drinking wine. Let’s take a look at a few of them and we’ll begin in Genesis 14:18 in which refers to Melchizedek as offering wine (yayin*) to Abraham; Nehemiah 2:1 refers to the king drinking wine (yayin*) (Nehemiah was required to taste it first to make sure it was not poisoned); Esther 5:6; 7:1-2 speaks of wine (yayin *) that Esther (the godly Jewess) drank with the king; Job 1:13 refers to righteous Job’s family drinking wine (yayin *); Daniel 10:3 speaks of drinking wine (yayin *) as a blessing after a time of fasting. Some of Jesus’ parables are about wine, wineskins, vineyards (Matt 9:17; 21:33; even John 15 speaks of God the Father as the vinedresser!). Paul tells Timothy to drink some wine (Oinos**) for his stomach’s sake and not just water (1 Tim 5:23). The same Greek and Hebrew terms that were used to speak of the abuses of wine are used in these passages. We have seen how the bible speaks negatively toward alcohol and how it sometimes speaks neutrally about the subject now let’s look at how the bible speaks of alcohol in a positive sense. The passage of Deut 14:26 (14:22-26 in its context) speaks of tithing but let’s look more closely at it. They were to tithe what the Lord had told them to tithe (obviously) and go to wherever God told them to go. Verses 24-26 are key, If the journey was too far for them to carry the entire tithe (what belonged to God) then they were to sell it (turn it into money) and take the money to where God tells them to go. Now look at verse “26And thou shalt bestow that money for whatsoever thy soul lusteth after, for oxen, or for sheep, or for wine (yayin)*, or for strong drink (shekar*), or for whatsoever thy soul desireth: and thou shalt eat there before the LORD thy God,and thou shalt rejoice, thou, and thine household.” WHAT?!?! They were to take the tithe, that was God’s, and if the journey was too long they were to sell it and take the money and when they got to where the Lord was sending them they were commanded to buy (with God’s money) whatever they desired, in which specifically included wine (yayin*), yes the alcoholic kind, and if anyone wants to question that it even says “or for wine (yayin*), or for strong drink (shekar*),” the strong drink most defiantly was alcoholic. Not only that but it even says that they were to “eat there before the LORD thy God, and thou shalt rejoice.” Not only were they to do it but do it with the Lord’s money and they were to rejoice. The bible couldn’t be any clearer. Now moving on to other places where God’s Word speaks well of drinking alcohol. Psalm 4:7 compares joy in the Lord to the abundance of wine (tirosh*); Psalm 104:14-15 says that God is the creator of wine (yayin*) that “makes a man’s heart glad” (see also Hos 2:8); Prov 3:10 honoring the Lord with one’s wealth is rewarded with the blessings of abundant stores of wine (tirosh*); Ecl 9:7 (…drink your wine (yayin*) with a joyful heart…); Song of Solomon (1:2, 4; 4:10; 7:9) repeatedly compares love to wine (all yayin*) as though good wine were similarly sweet; and Isa 25:6 where the Lord prepares a banquet with “well-aged wines (shemar *)… and fine, well-aged wines” for his people; Jesus himself makes wine (oinos**) John 2:3, 9, 10; 4:46; Paul tells Timothy to drink wine (onios**) for his stomach’s sake in 1 Tim:5:23. The Nazarene vow (found in Numbers 6), was a voluntary vow for anyone (man or woman) who wanted to “separate themselves unto the Lord.” This vow had three absolute restrictions: 1: They could not have wine, strong drink, grape juice, or any fruit from the grape vine (grapes, raisons, or anything that was produced from it); 2. They could not cut their hair until their vow was complete; and 3. They could not touch or even be around dead bodies. There is no specified amount of time that they had to be separated so it is assumed that the individual got to choose their own length of time in the vow but once they chose to make the vow it was extremely strict. “He shall separate himself from wine (yayin*) and strong drink (shekar*); he shall drink neither vinegar (chomets*) made from wine nor vinegar made from similar drink; neither shall he drink any grape juice (mishrah*), nor eat fresh grapes or raisins” Numbers 6:3. The Hebrew word for grape juice here is mishrah* and it is used here and ONLY here in the bible. There are several verses that I can think of that are commonly misconstrued to mean, or to say, what they do not. I will go through these in order from the beginning of the bible to the end of the bible. A short but comprehensive list of the verses that I am specifically referring is as follows: Proverbs 23:31 (29-34 in context), Habakkuk 2:15 (5-16 in context), and Luke 1:15 (John the Baptist not drinking wine or strong drink). Please note that there are many more but these are the ones that I feel that I need to touch on for clarification reasons. Let us begin with Proverbs 23:31 “31 Do not look on the wine (yayin*) when it is red, When it sparkles in the cup, When it swirls around smoothly.” I have heard (and read) it said (and written) that when the bible refers to not even looking at wine and referring to this exact verse that when the bible refers to “when it is red” it is speaking of being fermented or “alcoholic.” So what they are trying to make this verse say is that we’re not supposed to even look at wine when it is fermented. Hmm, that’s very interesting. Now let me point out a couple of flaws in that theory. First of all, due to previous verses already shared you know that this is inaccurate. Secondly, the Greek word for look that is used here is “ra’ah,” which can be interpreted a several different ways and among them are “to gaze” or to “look intently at,” both of which would be more accurate (as we will see when we look at the whole context). Also, take into consideration that when they say “when it is red” is meant that its fermented, the Greek word used here is “’adam” and it does literally mean “to be red,” “to be rubbed red,” or “dyed red.” The word ferment is nowhere in there. Not to mention the word that is being used for wine here is the word yayin* meaning fermented wine. So if that’s the case why would he be referring to it as being fermented twice? It just doesn’t make any sense. When we look at it in its whole contexts it begins to make a little more sense. “Those who linger long at wine (yayin*), those who go in search of mixed wine (mamsak*). Do not look (gaze, or look intently) at the wine (yayin*) when it is red.” So now I think any sense able person would ask “Then what is the significance in putting “when it’s red” in there?” And that my friend is an excellent question. For that answer you have to look at who the people were and what their culture was at the time. First you have to realize that the people that are being talked about are the Canaanites that are drinking to get drunk. These verses are obviously warning us of drunkenness. However in the land of Canaan, red wine was the most esteemed wine and was fully fermented. Used in the context, the Canaanites were “lingering long after wine” and going “in search of wine.” So, for the time period the red wine is what they lusted after and for purposes of getting drunk, in which, the bible clearly points out in the next verses (look also under: The Bad) and it is wrong and sinful. “When shall I awake, that I may seek another drink?” They are wanting to wake up just to drink more. Let us also look at Habakkuk 2:15. When most people quote this verse they quote it like this “Woe unto him that giveth his neighbour drink…” thus making it sound like if you give someone an alcoholic beverage then you are sinning against God. Look at the whole verse “Woe to him who gives drink to his neighbor, Pressing him to your bottle, even to make him drunk, That you may look on his nakedness!” This verse doesn’t even give an alcoholic beverage word in the Greek. The NKJV does a good job here of saying what the Greek actually says unlike some other versions that like to input wine or some other word. But it says to “gives him drink…pressing him to your bottle, even to make him drunk.” You see the Hebrew word here “shaqah” means to drink, not as in alcohol but “to give to drink, irrigate, drink, water, cause to drink water” but alcohol is inferred by the Greek word “shakar” meaning to become drunk. So this verse goes along with what the rest of the bible has been saying, that getting drunk is sinful, not drinking in itself. Now we are free to move onward to Luke 1:15 in which many quote like “For he will be great in the sight of the Lord, and shall drink neither wine (oinos**) nor strong drink (sikera**). He will also be filled with the Holy Spirit.” The ones that quote this verse take it completely out of context. They try to make it sound like God is trying to say that we are not to drink wine or strong drink. Now let’s look at the whole verse “For he will be great in the sight of the Lord, and shall drink neither wine nor strong drink. He will also be filled with the Holy Spirit, even from his mother’s womb.” “Even from his mother’s womb?” Who is this talking about? Let’s now back up a little bit and read it in its context. “12And when Zacharias saw him, he was troubled, and fear fell upon him. 13But the angel said to him, “Do not be afraid, Zacharias, for your prayer is heard; and your wife Elizabeth will bear you a son, and you shall call his name John. 14 And you will have joy and gladness, and many will rejoice at his birth. 15 For he will be great in the sight of the Lord, and shall drink neither wine (oinos **) nor strong drink (sikera**). He will also be filled with the Holy Spirit, even from his mother’s womb. 16 And he will turn many of the children of Israel to the Lord their God.” Luke 1:12-16. It goes on to tell of other things that John will do and the conversation continues. Why is the rest of the story important? Because it tells us that this is talking about one individual. It is by no means talking about the entire human race. Myth busted! You would be surprised at the amount of people, and even very respected and knowledgeable people, preachers, and even pastors that take/use this verse out of context. The book of Romans (chapter 14 to be more specific) makes it very clear that we are not to be a stumbling block for our brothers and/or sisters in Christ. We are to build each other up not tear each other down. It seems, to me anyway, that we instead of building each other up we are finding the little bittiest of things to try to prove people wrong and to make them look bad. That is wrong and flat out ungodly. People should be able to look at us and be able to tell that we are different than the world; instead we are to be the light of the world. I’m not going to quote the entire chapter of Romans 14 but I encourage you to read it. I will, however, point out a few verses in it. Romans 14: “1 Receive one who is weak in the faith, but not to disputes over doubtful things.” “10 But why do you judge your brother? Or why do you show contempt for your brother? For we shall all stand before the judgment seat of Christ. 11 For it is written: “As I live, says the LORD, Every knee shall bow to Me, And every tongue shall confess to God.” 12 So then each of us shall give account of himself to God. 13 Therefore let us not judge one another anymore, but rather resolve this, not to put a stumbling block or a cause to fall in our brother’s way.” “18 For he who serves Christ in these things is acceptable to God and approved by men. 19 Therefore let us pursue the things which make for peace and the things by which one may edify another. 20 Do not destroy the work of God for the sake of food. All things indeed are pure, but it is evil for the man who eats with offense. 21 It is good neither to eat meat nor drink wine (oinos **) nor do anything by which your brother stumbles or is offended or is made weak.” It is pretty plain to see that God wants us to be at peace with one another and put aside meaningless things like food and drink and focus on winning souls for Him. “…but not to dispute over doubtful things” Romans 14:1. It is no secret that drinking in excess is very harmful for you. Drunkards have many diseases and the CDC (Center for Disease Control) openly, as they should, warns against them. We all know that getting drunk messes up your vision, motor skills, and ability to know what you’re doing. However, many people don’t know that moderate drinkers tend to have better health and live longer than those who are either abstainers or heavy drinkers. In addition to having fewer heart attacks and strokes, moderate consumers of alcoholic beverages (beer, wine and distilled spirits or liquor) are generally less likely to suffer strokes, diabetes, arthritis, enlarged prostate, dementia (including Alzheimer’s disease), and several major cancers. 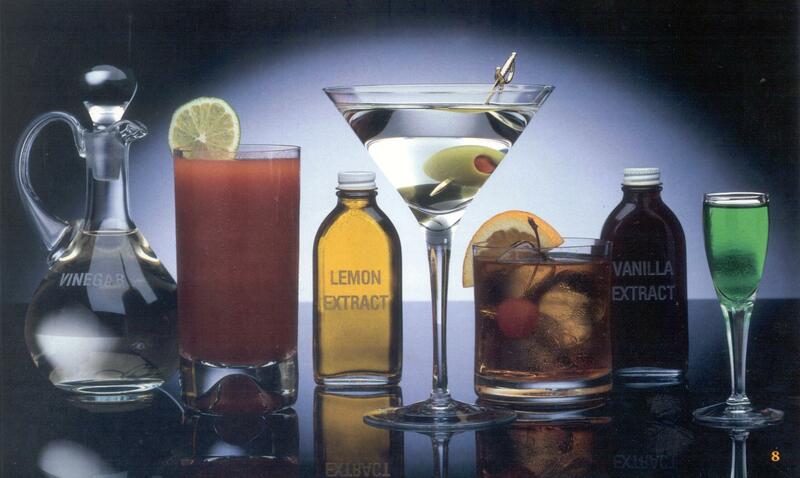 Medical researchers generally describe moderation as one to three drinks per day. It appears that consuming less than about half a drink per day is associated with only very small health benefits. 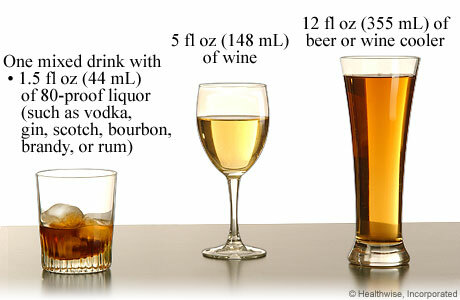 Four or five drinks may be moderate for large individuals but excessive for small or light people. Because of their generally smaller size and other biological differences, the typical woman should generally consume 25 to 30 percent less than the average man. And, of course, recovering alcoholics, those with any adverse reactions to alcohol, and those advised against drinking by their physicians should abstain. Drinking in moderation has been described by the National Institute on Alcohol Abuse and Alcoholism (NIAAA) as a man consuming four drinks on any day with an average of 14 drinks per week. For women, it is consuming three drinks in any one day and an average of seven drinks per week. 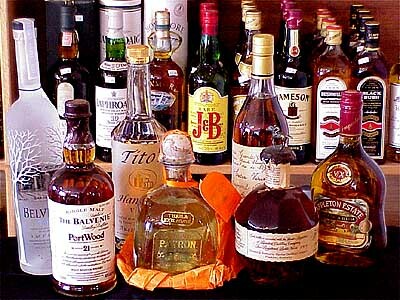 A standard alcoholic drink is: A 12-ounce can or bottle of regular beer, a 5-ounce glass of dinner wine, or a shot (one and one-half ounces) of 80 proof liquor or spirits such as vodka, tequila, or rum either straight or in a mixed drink. If the bible was to refer to wine as non-alcoholic grape juice then why didn’t it use the word mishrah* like it did in Num 6:3? Mishrah* literally means juice in Hebrew. The fact is that it doesn’t use that word and wine is referred to as wine is because it is in fact fermented wine. With that being said the Greek word for grape juice is “trux” and it is not used at all anywhere in the bible. Some people come up with the argument that when the bible speaks of wine it means “new wine” and that new wine means unfermented grape juice. This is very inaccurate, sometimes the bible uses the word tirosh*, asis*, or gleukos**. These words mean: “sweet wine” or is sometimes referred to as “new wine” which even in its contexts means that it is not fully fermented (key word being fully), by being new it means that it is only in its first year of the fermentation process and it can represent wine in any stage of the fermentation process (in the first year). If the authors wanted to represent juice they would have said mishrah* or trux** and the fact that they didn’t means that they meant what they said, wine. After reading all the facts (over 200 verses in the bible referring to alcohol and in their context) I conclude that drinking alcohol in itself is not a sin. Not only is it not a sin it is welcomed. Wine is a blessing from the Lord, something to be enjoyed. But like any good gift from God, it can be abused. This abuse is getting drunk and can involve addiction; both of which have dire consequences. However, when we condemn those who are able to enjoy God’s gifts in moderation, as though they were abusers themselves, we are lacking biblical character. With that being said we must be careful of not becoming a stumbling block for someone who considers and/or thinks drinking is a sin or for someone who has/had a drinking problem. If they fall into getting drunk because of you then you, along with them, are actually sinning. It’s kind of a “guilty by association” if you will. Proof of this, for those of you who want it, is Romans 14:21 “It is good neither to eat flesh (meat), nor to drink wine (oinos**), nor any thing whereby thy brother stumbleth, or is offended, or is made weak.” If there’s even a chance that it will make someone stumble, make them weak, or even offend them, then don’t do it. If you’re going to get drunk, or if there is a chance that you’re going to get drunk then don’t do it, BOTTOM LINE! These are my thoughts, based on my research, and I welcome yours. Like I said from the beginning, I just ask that any comments be made respectfully. The Hebrew word tirosh* I said meant (and I quote) [properly “must”; sometimes rendered as “wine,” “new wine,” or “sweet wine.” It can represent wine at any stage in the fermentation process and in some places it represents wine made from the first drippings of the juice before the winepress was trodden. As such it would be particularly potent. It can certainly be alcoholic, as in Hos 4:11.] Now what I said was not inaccurate however I do believe it was rather misleading. I kind of made it sound like it was always alcoholic and the truth is that it is not. However the opposite is also not true. People try to say that it is just grape juice and isn’t alcoholic at all and that’s not true either. It can be rendered as fresh, or just squeezed out, juice, it can implicate wine at any stage in the fermentation process (within the first year). The bible uses this word in several ways as both alcoholic and non-alcoholic. Having been led, as we believe by the Spirit of God, to receive the Lord Jesus Christ as our Saviour and, on the profession of our faith, having been baptized in the name of the Father, and of the Son, and of the Holy Spirit, we do now, in the presence of God, and this assembly, most solemnly and joy­fully enter into covenant with one another as one body in Christ. We engage, therefore, by the aid of the Holy Spirit to walk together in Christian love; to strive for the advancement of this church, in knowledge, holiness, and comfort: to promote its prosperity and spirituality; to sustain its worship, ordinances, discipline, and doctrines; to contribute cheerfully and regularly to the support of the ministry, the expenses of the church, the relief of the poor, and the spread of the gospel through allnations. We also engage to maintain family and secret devotions; to religiously educate our children; to seek the salvation of our kindred and acquaintances; to walk circumspectly in the world; to be just in our dealings, faithful in our engagements, and exemplary in our deportment; to avoid all tattling, back­biting, and excessive anger; to abstain from the sale of, and use of, intoxicating drinks as a beverage; to be zealous in our efforts to advance the kingdom of our Savior. Well there are a couple of things we must note about this. First we must note that we are under the authority of our leaders both church officials and government leaders. Romans 13:1 says “Let every soul be subject to the governing authorities. For there is no authority except from God, and the authorities that exist are appointed by God.” If this Church Covenant is what they say we must go by then this is what we must go by that’s just the bottom line. However something that I have recently discovered is that this “Church Covenant” is not a governing publication of the Southern Baptist Convention. As it turns out the version of the covenant most common among Southern Baptists dates back to 1833, when J. Newton Brown is said to have attached it to his confessional statement which he submitted to the New Hampshire Baptist Convention. He reportedly published the confession and covenant in 1853 under the title “the New Hampshire Confession of Faith.” That larger document served as the model for the first version of the Baptist Faith and Message in 1925. Now the Baptist Faith and Message is a publication of the Southern Baptist Convention and along with the 1925 version there have been three more updates with the latest version being the year 2000. I would like to point out that there is no mention of a stance for alcohol in the Southern Baptist Convention or its Baptist Faith and Message. However, even if there was mention of condemning it, it would not necessarily affect every believer. You see the Southern Baptist Convention considers each church to be autonomous and self rule. A Southern Baptist church is about as independent as you can get and still be counted as part of a denomination. For more on this I refer you to http://sbc.net/aboutus/default.asp. Keep in mind that all of this is just from the Southern Baptist Convention. There are 41 State Conventions across the nation that are authority figures that each state has to look at. Not only State Conventions but as well as associations across each state and country that each individual and state must look at. If the individual state and association considers each church an autonomous body then you must look at your church’s own Constitution, By Laws, and Church Covenant. Although many churches adopt the same Church Covenant doesn’t mean they are all the same. I believe that when an individual becomes a member of a church that church should have a class for them to go over the constitution, bylaws, and the church covenant so everyone knows and are not left wondering. If it does not go against any of these things then it is not a sin to drink alcohol. If it does go against the church’s (state convention, association, or church’s) teachings then it is a sin and should be refrained from. I have to disagree strongly on your conclusion. I have written my own blog post about the subject but I have to at least say it again, loud and clear, that if you persue an alcoholic drink, you are pursuing the intoxication effect. I don’t believe God contradicts Himself and if He said is bites like a serpent and stings like an adder (poisonous snake), then that means it is harmful. If he said “woe to him that giveth his neighbor drink,” then He wouldn’t go back on His word. That’s common sense. I thank you for your input. You disagree with me so I obviously disagree with you. I do, however, respect your opinion. I disagree with your notion that “if you persue an alcoholic drink, you are pursuing the intoxication effect.” That is just not true. I do agree that if you get drunk or are pursuing drunkenness then it’s a sin against God. As far as the “woe to him that giveth his neighbor drink,” goes, the way its worded in the Greek that sentence makes no sense once so ever. The word used for drink there is not an alcoholic drink. The word used as drink is literally drinking as in water, tea, or anything. Read the rest of that verse. Also I recommend you read the whole thing or at least the “commonly misused scripture” part of it. Chris, I love that you wrote this blog. Although for most individuals not brought up in the word or around God’s word often, they would find parts of your blog hard to follow. Your main points overall were very clear. I will be honest, I use to always think (and was always told) drinking was a sin and should never touch it. Once I grew up and read scriptures myself and prayed myself and sought God myself I came to the same conclusion you have. 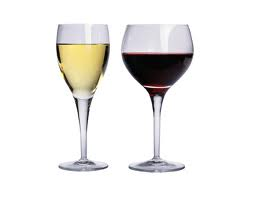 Having a glass of wine is not a sin (if it were they would not offer wine as the blood of Christ in churches in the Eucharist or Lord’s Supper). HOWEVER, it is something to reconsider doing if you are becoming “drunkard” as God’s word uses. Each individual child of God has to make their own decision about to fully reject alcohol and only listen to pieces of scripture or look at the Word in its WHOLE and in Context. And in the end, the decision is between ourselves and God. Thank you Brittan, I agree with you 100%. I went into this expecting to get all kinds of grief from believers. I’m glad you agree. First off, thank you for your input, I appreciate it. On that note I would have to say that you are right. I intended to put a paragraph in there about obeying our leadership. Most of the time when the bible refers to this people automatically think of following the laws of the land. We should obey the laws of our country, state, and local governments however it is also true that we need to follow our church leadership. They, like our country’s leaders, are given to us by God. I actually had a conversation with someone about that not very long ago. I was wrong for not adding that and I apologize, I’m sorry. The law says that we can’t drink alcohol until we’re 21 years old. Therefore if we drink before we’re 21 we are breaking the law (unless for medical purposes [doctors orders]). Like I said before you are correct concerning the Baptist Covenant, sometimes called the “Church Covenant.” It says that members should not buy, sale, or drink any alcohol. That’s not a vow that you take but if you are a member of the church (unless you leave that particular church) then you should adhere to it. I personally disagree with the Baptist Covenant on this particular issue because there are several verses in the bible that make it to questionable for them to take a stand and say that we should not do it and we are going to abstain from it. There are bad things that they bring but there is a lot of good that it can bring to. I believe its each individuals personal decision that they should make with God. There are people with more letters behind their name than I do (considering I have none) that are at the Southern Baptist Convention (which is about 10 or 11 miles from where I live) that make those decisions. Those are not my decisions and that’s between them and God. We do have other forms of medication (as they did in that day as well, natural herbs and such) but most of the medications we have today bring bad side effects. Yes alcohol can make you drunk if you drink too much but it’s not going to give you bad or life altering side effects that most other drugs do. Not to mention that red wine specifically has an ingredient in it called resveratrol that is only found (naturally) in red wine. It is super good for your health. It fights cancer in all three stages not to mention hundreds of other things it helps with. It is one of the best things for man, extremely healthy. People in France drink red wine a lot and they have one of the worst diets in the world but yet they are some of the healthiest people in the world. That’s why is because they drink red wine. Resveratrol is only one of the helpful things in red wine; it has a lot of natural antioxidants in it. Not only wine my uncle has kidney stones and his doctor told him to drink one to two cans of beer a day because it helps with your kidneys. Not to get drunk but because in moderation it’s good and healthy for you. Wow Chris, I love all that you put into this. There is a lot to take in. I think a drink is not a sin. Drunkenness is. That’s me. Do Americans do anything in moderation? Excellent blog! I wish more Christians; pastors and leaders in particular would be able to speak from a more educated perspective than just an emotional one. I would be very keen to see what you have to say about tithing, the 10% in particular. @Carissa Thank you! I’m glad you can tell what all went into writing this. I agree with you as well. @Shay Thank you. I appreciate your input. I have several other blog titles I have to get to first but I will make sure I put the topic of tithing on my to-do list. Chris… Good research… well put together blog. Good job bro. You pretty much nailed what you already know is my view and belief on the subject. Colossians Ch 2 sums up a lot of this and can include many other subjects as well. Don’t have time for more… could go on and on. Again… Good job bro! Great stuff Chris, good research. I am right there with you man. I didn’t start doing the research on it until lately, and I really like how you pooled it all together. What Version of the Bible Should I Read?